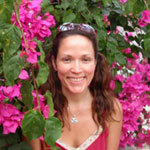 Helen Fraser, MA, RYT, has been a devoted yoga practitioner for over 15 years. She has been teaching for 12 years to a variety of students at many San Francisco locations, including gyms, jails and spiritual centers. To keep her teaching fresh and informed, Helen continues to practice and study, drawing from the abundance of yoga traditions & teachers in the Bay Area. She has taught at numerous retreats, workshops and fundraisers over the years, in California, Oregon and even Scotland! Through the complimentary paths of Buddhism and Yoga, Helen has created an inwardly directed, contemplative style of yoga that lends itself to both a rigorous vinyasa and traditional hatha practice.